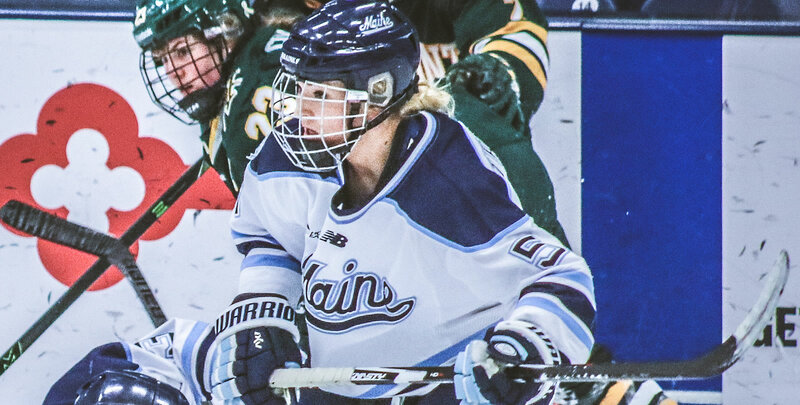 BURLINGTON, Vt. - Ebba Strandberg's second-period goal helped the visiting Maine Black Bears (10-6-1, 4-6-1 WHEA) edge out the Vermont Catamounts (3-9-4, 2-7-2 WHEA) Friday afternoon at Gutterson Fieldhouse. "There have been some games this year when I thought we beat ourselves and this wasn't one of them," said head coach Jim Plumer. "We played the way we wanted to and created abundant chances, but this was another game where we maddeningly, just didn't finish. Credit to Maine, they made one more play than we did, but I would love to see this offense play up to its capability." - Vermont nearly opened the scoring in the first minute of the game when Theresa Schafzahl dished a pass to Ève-Audrey Picard who one-timed a shot off the post. However, Maine was the team to find the scoresheet first when Tereza Vanisova redirected a pass from Vendula Pribylova under the pads of Melissa Black (25 saves). - Taylor Flaherty answered for the Catamounts with 11:54 left in the first period when she wristed a shot from the point into the top corner. As a UVM power play expired, Saana Valkama gave the puck back to Flaherty for the tying marker. Picard had the secondary assist. )- The second period action came in the middle of the frame. Kristina Shanahan snapped a shot from the slot on the power play that Carly Jackson (23 saves) was barely able to get a glove on. Maine retook the lead with 7:41 left in the period though when Strandberg's slap shot from the top of the zone beat Black. Michelle Weis and Brittany Colton assisted on the Black Bears' game-winning goal. - UVM outshot the Black Bears 9-6 in the third period and had a variety of scoring chances. They had 1:26 with a 5-on-3 advantage, but were unable to score. Later on in the frame, Picard sent Schafzahl on a 1-on-1 rush and the rookie got a nice shot off, but it was kicked away by Jackson. The Catamounts return to action Saturday (Dec. 1) to close out the two-game home series with Maine. Puck drop for the final game at Gutterson Fieldhouse of 2018 is slated for 1 p.m. Fans are encouraged to bring stuffed animals to toss on the ice for the annual Teddy Bear toss. The bears will be collected and donated by the team to local kids in need.